Set amongst the beautiful Northamptonshire countryside, this 60-acre privately owned woodland garden contains a large and notable collection of plants; ranging from unusual trees and shrubs to a wide selection of lilies and other bulbs. The garden's unusual band of acid soil, in this otherwise predominantly alkaline area, provides the opportunity to cultivate plants such as rhododendrons, camellias, and magnolias, which would not ordinarily thrive in this location. 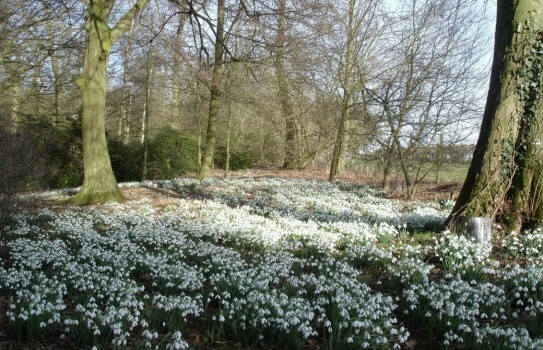 Carpets of named snowdrops in February run into wonderful spring bulbs and the garden's 800m long Scilla 'stream', as the garden jumps into life. Some 100 magnolias follow and are later joined by the first flush of new leaves, rhododendrons and azaleas. In the summer, over 300 roses and 150 lilies emerge, including Lilium 'Evenley Jane', which was developed and propagated on site. As the season slows down, a wonderful display of autumn colours can be seen in the leaf, bark, seeds and berries of the garden's plant collection, ranging from beautiful rustic oranges and fiery reds to greens, gold and brown. Collections of particular note in the garden include oak, pear, apple, maple and what is possibly the largest collection of euonymus in Europe. These sit alongside hardy bulb collections including lilies, spanning all hybrid types, scillas and snowdrops. If you want to take a break near Evenley Wood Garden, why not stay in one of our recommended hotels. Each hotel has genuine guest reviews enabling you to book from anywhere in the world in total confidence. Not only do we feature hotels near the garden, we also feature hotels worldwide and at all major airports. Special prices up to 70% off standard rates as well as hundreds of exclusive deals. Look now - click here.